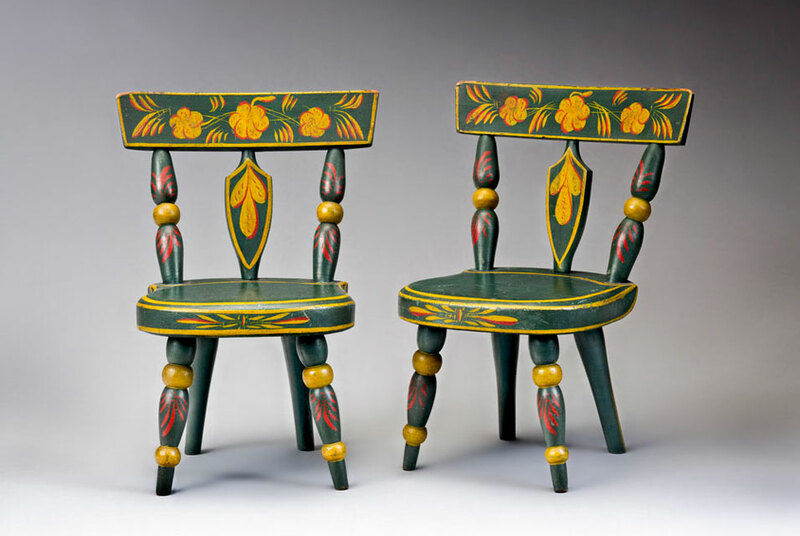 Pair of miniature tablet-top Windsor side chairs, Lebanon County , Pennsylvania , or possibly Baltimore , Maryland , circa 1825-1840. Poplar, original painted decoration, each 12 x 9 x 7½ inches. Courtesy Jane Katcher Collection of Americana . Photograph by Gavin Ashworth. NEW YORK, N.Y.- When Expressions of Innocence and Eloquence was published in 2006, one of the countrys most important collections of American folk art and Americana was brought to the publics attention for the first time and met with an unprecedented level of interest and approval. This praise inspired the continued research and study of the Jane Katcher Collection and led to Expressions of Innocence and Eloquence: Selections from the Jane Katcher Collection of Americana, Volume II, edited by Jane Katcher, David A. Schorsch and Ruth Wolfe (Marquand Books/Yale University Press, $95.00), which will be published on November 15, 2011. Containing nearly 100 recent acquisitions, Expressions of Innocence and Eloquence, Volume II, offers a fascinating array of 18th- and 19th-century Americana, folk art and decorative arts created in New England, New York and Pennsylvania. The book features familiar American folk art traditionsportraits, quilts, weathervanes, boxes, trade signs, miniature portraits, schoolgirl art, furniture, rewards of merit and Shaker objectsas well as objects such as love tokens and friendship albums and a masterpiece of Native American basketry woven in Nevada in 1913 by Louisa Keyser (also known as Dat So La Lee). Although this book is a companion to the earlier volume, it differs in its organization and exploration of the featured works. In volume II, a smaller number of pieces not previously presented are discussed in greater detail within five primary themes: the collectors personal viewpoint; the fascinating and often overlooked history of the families who originally owned these objects; new discoveries about the artistsand makers; interpretations that examine and expand upon familiar subjects; and unique connections that link specific works in the collection and bridge the two books. Expressions of Innocence and Eloquence, Volume II, includes 19 essays by leading scholars and writers: The Mygatt Family Portraits by John Brewster, Jr. by Richard W. Stevenson; Small Portraits to Cheer the Lonely Heart by Robin Jaffee Frank; Three Notable Portraits by Ammi Phillips by Paul S. D Ambrosio; The Devotion Family Dressing Table by Richard W. Stevenson; Portrait of Annetje Kool by Pieter Vanderlyn by Paul S. D Ambrosio; Morris Lords Sign by Richard Miller; Emeline M. Robinson Kelley: Artist and Teacher of Portsmouth, New Hampshire by David A. Schorsch and Eileen M. Smiles; Unlocking the Mysteries of the Wilkinson Limner by Deborah M. Child; Two Small Weathervanes by J. Howard & Co. of West Bridgewater, Massachusetts by Richard Miller; Dat So La Lee and Her Baskets by Robert Shaw; Father and Son: The Painted Furniture of George Robert Lawton, Senior and Junior by David A. Schorsch; The Angstadt-Hoff Pipe Tomahawk by Peter Swift Seibert; Jewish American Folk Art: Between Two Worlds by Robert Shaw; A Rare William and Mary Cabinet: Some Thoughts on Its Function and Origin by Alan Andersen and David A . Schorsch; Educating America: Rewards of Merit in the Early Republic by Erin E. Eisenbarth; A Fame Weathervane by Robert Shaw; Innovation and Refinement in Shaker Design: An Analysis of Five Classic Shaker Objects by Robert W. Wilkins and Forget Me Not: James H. Gillespies Portraits of an African American Couple by Robin Jaffee Frank.